Like everyone else, I’m trying to make sense of the Australian election results: there’s a bigger picture here, and it’s a real shame that the first act of the ABC’s new MD is to axe the online edition of The Drum, which provided a place for intelligent opinion from outside the usual ossified media sources. Published in March 2016, this essay Balancing Act, Australia between Recession and Renewal was written before the election and it makes interesting reading now. As we can see, our political commentators are scrambling to deal with what amounts to paralysis while we wait to see if we end up with a majority government emasculated in more ways than one, a minority government governing either with some sort of negotiated agreement or at the whim of the independents, or *shudder* utter chaos. 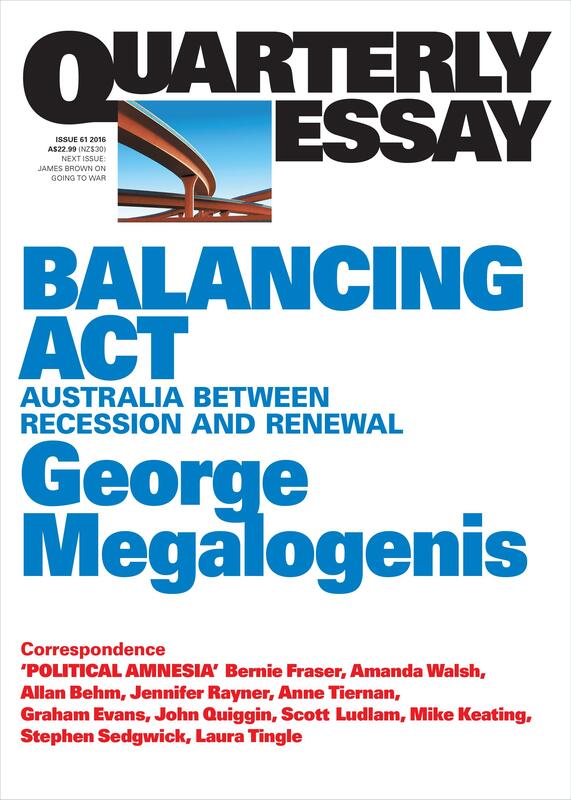 But back in March Megalogenis was reminding us of the media’s role in the national conversation that Australia has to have, about how we manage the economy in the wake of the mining boom, the birth of the Asian century and out-of-control globalisation. We weren’t having that conversation when Abbott’s Hockey budget was shredded; it was analysed by our media as a failure of marketing, a problem they thought would be solved by the delivery of a new salesman, i.e. Malcolm Turnbull. The most consistent message sent by voters to the main parties over the past decade and a half has been the demand for security. Both sides have taken this to mean border protection and bribes at the ballot box; one fist clenched against the rest of the world, while the other hand offers cash to the most aggrieved. Yet each leader that tried this was bewildered when voters could not be appeased. The truth is that the demand for security is more sophisticated than politics has allowed. We want our leaders to think for the long term; to prepare us for life beyond the mining boom. Both sides have found this in their research since the earliest days of the boom, but both have been unable to see past the next Newspoll. Something deeper is happening here than the predictable incompetence of politics. The system knows what voters are really asking for: a return to some form of government intervention in the economy. Yet this is resisted because of a misguided faith in the open economic model. The only leader who seriously tried to find a way out of the impasse was Rudd, but he lost focus after the global financial crisis. Now a Liberal prime minister is being asked by the public to redraw the line between the market and the state. (Chapter 1, italicising is mine). Megalogenis may have got it wrong when he wrote that voters don’t just want a return to adult government; they crave new ideas, so that the future does not seem so intimidating. The evidence seems to be that some in the electorate just want the 1950s back again. He may also have got it wrong when he predicted that Turnbull could retain his popularity because the public is willing him to succeed. But he wasn’t wrong when he warned that political celebrity could be a trap. Get it wrong, as Rudd did, and people conclude that you’re just another politician. Our cynicism about politics is going to cost us dearly. The political system cannot restore public confidence without a more responsive government. And the economy won’t stabilise without a more active government. The default setting of politics in the twenty-first century – to trust in the market – has proven to be bad economics, even for Australia, the only high-income nation to avoid the Great Recession. It has left us with gridlocked cities, growing inequality and a corporate sector that feels no obligation to pay tax. (Chapter 1). My eyes usually glaze over when I’m reading stuff about economics, but Megalogenis makes it reasonably palatable. I’m not (obviously) well-read in economics, but I haven’t seen an analysis before that explores the differences in the male and female economy, nor one that cuts through the hoopla about penalty rates. Chapter 3 goes on to explain the lost opportunities of the Howard era revenue boom and how stupid we have been as a nation not to have invested in infrastructure instead of frittering our revenue away on tax cuts for plasma TVs. Labor under Rudd did the same, giving a pension increase even when the budget was in deficit. How could he not, given that sense of entitlement? But what voters really want, according to Megalogenis, is for governments to stop throwing money at them and spend it instead on infrastructure. Anyone trying to find a bed for an Aged Parent knows this is true. It’s equally true when we try to move around our cities in traffic gridlock. And we want our regional cities and towns to have the infrastructure they need too, not just because it makes decentralisation more appealing but because it’s their right as citizens. But sorting out our national financial problems has become such a political football that there was never any real attempt by either party to explain the problem to the electorate, and goodness only knows how it can be sorted out now, given the calibre of some of the new Senators. The Quarterly Essay never fails to impress with the quality of its essays, and this one is one of the best. Perhaps while our politicians are biting their nails to the quick they might read it, and learn something? PS If you’re not totally over the election by now, you might enjoy this article ‘Election Myths in the Making’, by Tim Colebatch, at Inside Story, one of my favourite sources of intelligent discourse about politics. The guiding principle for government intervention might therefore be this: governments should engage where the evidence shows they can make a difference. concern about the prospect of another financial crisis. Available from Fishpond: Balancing Act: Australia Between Recession and Renewal (Quarterly Essay), from Readings, or subscribe from the QE website. I could do with a similarly well thought piece about the mayhem that is hitting the UK government system right now. Another example of where one group of politicians totally misread the public mood and another mislead people. How is the political commentary scene in Britain? I don’t mean the tabloids and the old press, I assume they’re the same as ours. I know you have The Conversation as we do… but do you have independent alternatives like Inside Story which is published by a university? Thanks Lisa for bringing this to our attention. A reminder to go and buy a copy. Alas, it’s not always easy to buy a copy, I was a subscriber right from the beginning for about three years, and then stopped in a misguided economy drive because I found I didn’t always have time to read them and didn’t have storage space. But now in retirement I find if I leave it too late then I miss out, and it’s hopeless relying on my otherwise excellent library. Because the topics vary from month to moth, they don’t keep them together on the shelves. I tried reserving them but half the time I’d forget so now I’ve resubscribed. I’m pleased with the election result. Journalists have a Mussolini complex with their calls for ‘strong government’ but the so-called hung parliament should lead to a more democratic outcome and less rule by executive fiat. And yes, I think the electorate do want more sophisticated economic outcomes than just an occasional fistful of dollars. Well, I think it’s good that they can’t take the electorate for granted now, but I do worry that not everyone in the new parliament will serve in the national interest rather than narrow sectional interests. Most women in Australia will remember the pernicious influence of Brian Harradine whose bigoted Catholic beliefs denied women control of their own bodies. I don’t want to see that again. Brian Harradine wasn’t Robinson Crusoe – you’re talking about half the Liberal Party, not to mention a good portion of the Labor Right. Yes, but it was his position of power that gave them power too. Great write up Lisa. I’d love to find time to read more Quarterly Essays. They are great. The point about “property obsession” is such a complex one. I often wonder about the fact that we feel we must own (and of course I’ve bought into that because it’s what we grew up with) whereas in much of Europe I understand renting is far more common. However, to be a renter you do need some sort of security so that the place you rent can become a “home” but that would involved a HUGE change in thinking here for renting to work like that. I was surprised recently when a friend of mine told me that her daughter and son-in-law were considering buying a house. It was actually a duplex – a larger 3BR home attached to a smaller 1BR one – and the whole was up for sale. The son-in-law said to my friend’s daughter to ask her parents whether they might like to buy the 1BR. When she demurred, he said “no, ask them, baby boomers love buying property”! Wow, I hadn’t realised our generation was seen that way. We bought a second property once but only kept it for a short time and have never been tempted to do it again. I find the whole property situation and debate so complex and difficult to tease out the pros and cons of the various approaches and arguments, but if current taxation etc policies are indeed making it easier for investors to buy than home-buyers then surely that’s a problem. Yes, I agree with you re expectations, and a lack of recognition re what many of us didn’t have in order to buy our usually basic houses. On the other hand, it’s also the case that proportional to incomes the cost of housing is higher, and that is scary. I do sometimes resent the whinging and blaming of our generation, though, because we worked hard and did without. I’m certainly not wanting sympathy for us, we were lucky in many ways, but I’d like some recognition that different times have different issues and that it wasn’t all fun, fun, fun and easy, easy, easy for us. Indeed, some of our friends in the late 1980s got caught by those 17% or so home loan interest rates. Comparisons in other words aren’t simple, are they. Better we all work for a better lives for all than finger point and blame the past. We were lucky enough to hear George M and Laura Tingle in an open forum a few months ago. Both were very strong on the issue of the loss of collective memory in the public service (Tingle wrote an earlier Q Essay on this) and the increasing tendency of both sides to appoint (on contracts) people of their own viewpoint. This I think is one of the major dangers to our democracy. I agree so strongly with George that governments must be active players in the economy, not just wielders of the market levers, and I think it’s becoming increasingly clear across the world that that has to be the case. But how do you get it to happen? It’s ironic in this globalised economy that governments can’t sit down together and come to a global position about reining in unfettered capitalism and pulling back on the gospel of growth growth growth. *wags finger* It would take idealists to achieve it, not cynics!